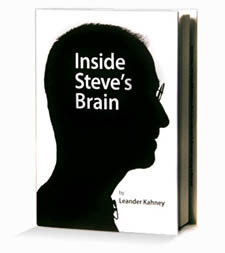 iPhone pre-launch: Looking "Inside Steve's Brain"
Author Leander Kahney on Steve Jobs' success. Just a few hours from now, Apple CEO Steve Jobs will take the stage at the company's developer conference in San Francisco and -- almost certainly -- unveil a new version of the iPhone. We know the new phone will pack faster cellular networking -- known as 3G -- and that Apple will finally allow outside developers to create programs for it. The device's other features, though, remain sealed behind Apple's nearly impregnable wall of secrecy (nearly impregnable: Many educated guesses are floating about). But while we wait, it may be fun to consider the man behind all the secrecy, as well as all the success. I recently chatted with Leander Kahney, an old Wired.com colleague of mine who has just written "Inside Steve's Brain," a highly entertaining, penetrating look at Apple's rebirth under Jobs. Leander and I talked about how Jobs refashioned Apple in the 1990s, how the company designs and produces its products, and whether Jobs learned anything from losing the PC market to Microsoft. Can you describe Apple's state before Jobs came back in 1996, and what he did to turn it around? Apple in 1996 was Microsoft in 2008 -- it was trying to do everything. It had a full range of hardware, from computers to printers and monitors. It had the Newton handheld. It had a whole range of software. It had a huge R&D group, too. Someone told me that the budget for the power brick for the early PowerBook was a million dollars. That was the kind of craziness that was going on at the company. There was no command and control. What was amazing was the decline was so precipitous. Apple had gone from being one of the biggest computer makers in the world to being in the worst trouble. When Jobs got there the revenues had gone from about $11 billion to about $6 billion, but it was still running like it was an $11 billion company. Gil Amelio [Jobs' predecessor] had made a lot of cuts. But Jobs had a much cleaner vision. He cut the company back to just four products. He did a comprehensive product review, but it was also a people review -- and that was how he discovered some of the talent at the company, including Jonathan Ive [who now heads Apple's industrial design studio]. So the story of Jobs' success is massive simplification. But I wonder what you think of the current lineup -- it seems it's getting more and more complex, with all the different iPods, the iPhone, a TV device ... Is that a danger for Apple? Not at all, because it's a very rational progression. They're all built upon the same foundation. They all use OS X, even the iPod. A lot of their computers are the same -- the iMac is essentially the same machine as the iBook and the Mac Mini; they've just patched them up and put them into different form factors. Or the iPhone -- that's built upon the expertise they got building the iPod. They just push the form factors a little, but it's a logical progression. You spend a lot of time describing how they come up with these products. It's a unique process, one that involves a huge number of prototypes. Can you describe it? It's a process where they discover the product through constantly creating new iterations. A lot of companies will do six or seven prototypes of a product because each one takes time and money. Apple will do a hundred -- that's how many they did of the MacBook. Steve Jobs doesn't wake up one morning and there's a vision of an iPhone floating in front of his face. He and his team discovered it through this exhaustive process of building prototype after prototype. The prototypes are fully functioning. They have a studio packed with high-end manufacturing equipment. Initially the prototypes are built in big polycarbonate boxes, but as they perfect the enclosure they'll build fully functioning models in the studio and then on factory lines to make sure they can be manufactured. One of the important things about this process is they often find what fails. Jobs has said he's as proud of the stuff they haven't done as the stuff they have done. They made a PDA in the late '90s to compete with the Palm, but they never released it because it didn't live up to their expectations. Some people see the phone market shaping up as a competition between Google and Apple. It seems Google might be playing the role Microsoft did with Windows in the early '90s -- its mobile OS, Android, is open; it's going to be available for all kinds of phone makers on all kinds of devices. It's almost exactly like the early days of the PC market. Apple's control-freak tendencies could be its own worst enemy. Developers would much rather work with someone like Google or Microsoft, which are much more developer-friendly, much more open, don't place so many restrictions on the experience. Did Jobs learn anything from the Mac experience? What distinguished them with the iPod was how they acted like their own worst nightmare -- they acted like their own competition. The iPod was updated so feverishly. They were so paranoid about someone coming along and taking it away. You'll probably see the same thing with the iPhone; there'll be a range of models, cheap ones and flashy ones. Do you think they can get to their goal of selling 10 million iPhones in 2008? The numbers there look like they're going to be pretty stretched. But they've struck these nonexclusive deals internationally, so I think 10 million iPhones in the U.S. is a stretch, but worldwide, I don't think they're going to have any problem. They've gone to all these markets overseas that weren't being served before. I sold my used iPhone to this guy on Craigslist, and he was selling it in Ukraine for $1,000. There's huge demand overseas. I also know a lot of people who are waiting for the iPhone 2. First, because they didn't want to buy the first version of a product, and also because it'll have 3G -- that's the thing, the fast networking. And having an OS you can load applications on, that's going to be big. There'll be a ton of experimentation with touch and tap interfaces. It won't be a locked-down device anymore. It's a platform. It's a mobile computer. I think it has the potential to be a really big platform.